Winamp is the grand-daddy of MP3 players. It has strong support for different skins and plug-ins, which you can download from the website. Stealth: ? No. Creates one folder and file to %APPDATA%\Microsoft\Crypto\RSA\. For full registry changes, read this. Remove all files and folders that begin with "$"
Note that the above extraction instructions are only applicable to Winamp Lite. Hank7 has kindly contributed extraction instructions for Winamp Full. It seems 5.66 will be the last Winamp version. @freakazoid: currently the count includes 23 megabytes of locale files. Winamp Lite is "just" 10 megabytes in size if you download the English-only version. Winamp is no longer the reigning king it once was. It maybe be prettier but Foobar2000 is much better and with that said Winamp is much better than iTunes, and Windows Media Player! Same problem with V5.6.0 Build 3080 as ntquartex and Wolfghost reported earlier - just the js files were extracted using Uniextract. Apparently uniextract doesn't fire off 7zip when working with this file. Good news: 7zip portable by itself does the job just fine! no flac play with winamp lite is a major buzz kill. Wondering if that works with custom builds of Winamp Lite as well. http://portableapps.com/node/21211 works but unsure whether this is the old or new version. I'm not sure if this has been mentioned or to the extent of its effectiveness but there seems to be a launcher for Winamp at http://portableapps.com/node/21211. 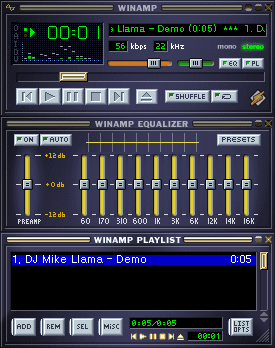 @eeefresh: This is Winamp Lite, it does not contain video support. If you want to use it to play video files as well, you will need the full version. Now you should be able to run WinAMP stand-alone, but cd burning/ripping and PRO functions WON'T work. For the most part it's made portable, but I wish somebody would make a PortableApps version. I tried uniextract on the newest version of Winamp, and it did not work...in fact I did get a number of useless file, one of which has no name. You can not delete this file through windows explorer, but it does NOT corrupt your filesystem!! You can now delete the file through the command prompt. I attempted to use UniExtract on winamp5552_lite_all.exe and it created 2 files that have corrupted my NTFS filesystem. They are on my desktop and their names are empty characters. It's a filesystem with NO filename. I can no longer CHKDSK the disk because it freezes when it finds those files. And for the past month, I have been unable to delete these files. do NOT try to UniExtract winamp, you will be in for a lot of trouble. Thanks mastervol for the file dump. I was unable to extract the files using Universal Extractor and your dump helped a lot. For 'Modern Themes' support in WinAmp you must have the 'gen_ff.dll' present within the plugins directory. I hope that this helps those wanting support for the 'Modern Themes'. Alexandre ! in my case it worked perfectly and I could hear it in my both ears and my both hands. I thank people for giving this good program. any update on this? can't seem to get Winamp 5.541 to go portable. Cannot extract Winamp Lite 5.53, it looks like they have been changed the compression mode. Any ideas? I would appreciate any help. I had apparent success, however, with Softpedia's Portable Winamp 5.5 (http://www.softpedia.com/get/PORTABLE-SOFTWARE/Multimedia/Audio/Windows-Portable-Applications-Portable-Winamp.shtml. I do need to test it some more though. how can i update my portable 5.0-version??? MPlayer, CoolPlayer, and VLC are all cool free alternatives but Winamp is the only one that has BOTH the right click on a directory play as well as the snap into place playwindow. I remember getting the .wal skins to work with 5.5 portable but I'll have to look at it to see what I did. I haven't found any problems making it portable the "Installation" way, Install it, when done, go to program files, winamp and copy and the entire folder somewhere else. Then uninstall, go back to your copied winamp folder and voila! you got it portable, I've tried it and it seems to work for me =), I tried this with the latest version of winamp. there is a problem with the setup of winamp lite to portability. when you have an installed version of winamp and you are running the "portable" version, when you open up the Preferences in Winamp, it auto-detects the settings from the installed version. Also, when the Playlist is minimized and you have selected "Use skin or language pack font" under the "Playlist" section in the Preferences panel, this doesn't use the skin's built-in font. There is a problem with .wal skins.I created a folder named "skins" and copied some skins,but only .wsz skins working.Does need to create another folder named "Winamp modern" and where to place it? That's a bold statement Pete. I'm gonna have to check that out. I LOVE VLC player. Haven't found a format it doesn't play and it's opensource/free. pjb: In addition, you can compress Winamp Modern's contents into a zip called "Winamp Modern.wal" and place it in skins to cut down on the file size. Don't compress the folder itself... this might not work, depending on your compression tool. Go into the folder and select skins.xml and all the folders therein for compression instead. Also any folder called $PLUGINSDIR contains files used by the INSTALLER ONLY and can be safely deleted (one of them contains the Sonic CD Ripping engine drivers which aren't portable anyways). I recommend you grab some files from Winamp Full, such as the input plugins Lite lacks. Also feel free to throw your favorite plugins into the mix as well. All DLLs and EXEs and W5Ss can be compressed with UPX and Winamp will still work. I recommend the --lzma switch. If you do a minimal Winamp a few of the DLLs in the root directory are not needed... experiment to see which ones can be removed with Winamp still running, I forget. Of course before you deploy your Winamp Portable will want to go to the Winamp Preferences > File types, select None, and uncheck all the checkboxes on that page. For the curious, paths.ini causes the winamp settings to be stored in the Application Data folder of the current user. Deleting it or (as I did) setting the value in the file to "." makes it portable. Also, Winamp Full, with all the files compressed with UPX and no files removed is 13mb. Still quite portable, but I believe I was able to get it down to 2-3 mb with just basic feature plugins, no modern skin, all input plugins, and a few of my favorite extra plugins. - Create a "Skins" directory where you extracted winamp to. - Cut/paste the "Winamp Modern" directory from "$R0" directory to the "Skins" directory. - Cut/paste all the contents from "$_OUTDIR" directory to the "Skins" directory. - You can delete the "$R0" and "$_OUTDIR" directories. - I also deleted "$PLUGINSDIR" from the Plugins directory. - I also deleted "$OUTDIR" (no underscore "_") since I think its related to the avs visuals which I do not plan to use. With this setup from the Full Basic version, I can use Modern Skin, plus be able to use the online radio and video streams. I currently have it on my hard drive but will put it on a USB drive so I can test for portability. Hmmm.... Can Winamp Lite use a Modern Skin? Maybe not. That might be the problem. Like Jens, I can't get the portable Winamp Lite to recognize any skin other than Winamp Classic. I copied the skin (Winamp Modern) into the Skins directory under Winamp Lite, and set the Skins directory to that directory. Winamp Modern shows up under Installed Skins in the skins browser, but says "no info found" if I highlight it. Any ideas? it complains about an "autoit error"
MPlayer rules portable! Nuff said. 1) Use notepad and add the URL to the radio station (e.g. http://www.club977.com/CLUB977HI.pls) in the first line. 2) Save it as a .m3u file (e.g. Club977.m3u). You should remove $PLUGINSDIR and leave the rest of the "Plugins" folder alone. You should also leave both Winamp "icons" (winamp.exe and winmapa.exe) alone. The former is the actual MP3 player, while the latter is an agent to help associate the file types to play with Winamp. That will fix the error! Great tutorial! I just started creating portable aps, and Winamp was one of those I just needed to have. Thanks for the reply noobie. I am running winamp from a thumb drive. The new skins are in the skins folder and I set the skin folder location but when I select a new skin it still doesnt change. Maybe it is just me...i will keep playing with it. Winamp's Video support requires that you have the codec on your system to play back different formats. By default it can play Cinepak .AVI files since that codec is a part of the Windows install. Look for the K-Lite Mega Codec Pack for all your video/audio codec needs. Is it possible to change skins? When I install a new skin, the skin manager recognizes the skin but will not allow me to select it. Thanks. I've gotten Winamp to do a semi-portable install where video will work. Do it with the FULL version (the next step up from 'lite') the same way it's described here. On the install computer it'll run fine. When I bring it to another computer I get an error message when it starts saying that it's missing a file, but it seems to play fine. You can also try "cPicture" for a small audio/video player that's under 1 Meg. Audio worked fine, but would not play video. Anyone know why?